Urika II is an ideal upgrade to the original highly successful Urika showcasing revolutionary digital phono stage design with an RIAA curve working in the digital domain. Earn 2750 loyalty points when you order this item. Linn LP12 Urika II Phono Stage Upgrade uses patented cutting-edge digital signal processing technology implementing the RIAA curve in the digital domain. This provides lower distortion, lower noise and more music. Transported over Exakt Link, the audio data that Urika II delivers is perfectly preserved until the moment it reaches your ears, delivering a musical experience like never before. 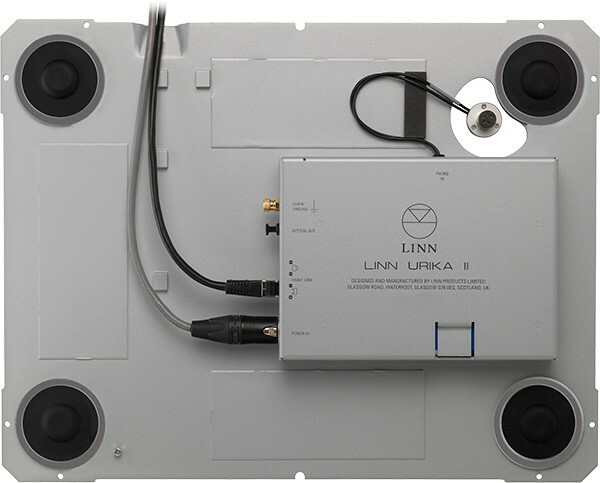 Linn's approach to the Urika II is the same as its approach to Exakt-enabled loudspeakers. This means each individual device can be optimised, correcting the variations inherent in the analogue stage to ensure outstanding performance every time. Urika II can be set to operate with your favoured load values. Just select from Linn’s popular cartridges or add your own and simply replace it when you next upgrade your cartridge. Urika II is driven by Linn’s impressive Radikal power supply and is supported on the Trampolin baseboard built-in to the Sondek LP12’s platter to retain isolation in the phono stage and enhance deck suspension. The ideal upgrade from Urika, Urika II has been tested in meticulous detail to quantify the transformation it creates and most crucially Linn use only their ears to listen.